Alberto Cerqui says he remains a ROAL driver despite being replaced for the Macau round of the World Touring Car Championship. The team announced on Tuesday that Kei Cozzolino would replace the former Italian Superstars champion for the season finale. Cerqui said on Wednesday that his original plan was to compete in Macau only if he was in the fight for the independents' title. The Italian lies in seventh place in the standings 64 points to the 138 scored by leader Norbert Michelisz. 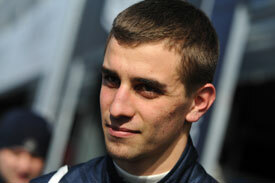 Cerqui said he remains confident he will continue to drive for the team next year. "Before the start of the season the team and I decided that I would have taken part in the round of Macau only if I were still in the fight for the Yokohama Drivers' Trophy", said Cerqui. "My debut year in FIA WTCC has certainly been positive even if I still have a lot to learn: the seventh place in the classification is quite consolidated and the round of Macau would have not been influential anyway. "This is where the decision comes of giving space to another driver. "I still am a ROAL driver though, this is the team that gave me more than any other allowing me to get the Superstars 2011 title and to take part in the world championship this year. "It is still early to talk about 2013, but I am confident I will defend again BMW's colours."